The young artist sported a jaunty beret and focused intently on his street mural. His concrete canvas displayed an array of bright colors and geometric shapes that swirled as if in motion. The composition literally caught the eye in that it featured a prominent eye peering out from the lower half of his work. Franz and “eye” sat at the nearby sidewalk cafe sipping our morning coffee enjoying his creative process. We had come to celebrate our 27th wedding anniversary in the charming city of Besançon, France and to partake in its culinary delights and sights. Besançon lies near the Jura Mountains on the border of Switzerland in the region of Bourgogne-Franche-Comte. The city is the capital of Doubs and has long been of strategic importance dating to 58 BC when it was first mentioned in the writings of Julius Caesar’s Commentari de Bello Gallico. Its name has Celtic origins and today it has been called “the first green city of France” and is lauded as a “Town of Art and of History.” I would only add AND delicious food to this illustrious title. Green spaces and sculptural art made from fine materials to found objects meld the modern with the past within the inner city. Historic architecture adorns the lively district and at its heart presides its crowning glory the Citadel of Besançon which is a recognized UNESCO World Heritage Site. The Citadel and its fortifications occupy a commanding position on the Mont Saint Ètienne and at its feet the emerald Doubs River meanders in a horseshoe course through the forested valley below. The fortress historically has served an important military function for the area and deservedly is Besançon’s top tourist destination. We wiled away many hours exploring the 11 hectares site whose paths wind through natural landscape and tended gardens making for a pleasureable walk up to its walls. A moat surrounds the citadel and baboons frolic and groom themselves in the enclosed area. The compound also holds a natural history museum and zoo the La Citadell de Besançon that boasts a collection of 400 animals from 70 species in and around the stronghold’s walls. There are also two other museums of note on the grounds. One is the Museum of the Comte Franche region that focuses on the Citadel and its architectural history and has a captivating multimedia presentation that brings the past to life. The second is the Musee de la Resistance et de la Desportation whose exhibitions relay the heroic yet sobering regional history of the French Resistance during WWII and is a must see for WWII history buffs. As the afternoon waned we strolled down the Mont Saint Ètienne to the iconic Porte Noire triumphal arch that leads to the entrance of the Cathedral of Saint John of Besançon. The 11th century Romanesque church exudes a massive quality but once inside the elegant arches and soaring ceilings blend together creating a harmonious whole. As we admired the interior space the afternoon sun lit the stained glass windows bathing the nave with a glowing brillance. It was illuminating. Passing time in the pious place we sauntered onto the impressive Astronomical Clock of the Besançon Cathedral. Intricate pendulums, weights, and a plethora of moving parts that record not only time but dates, leap years, moon and tide cycles. It even records an event that happens once every 250 years! It has been described as “one of the most complicated horological devices in the world.” The craftsmanship of this stellar time piece stands as a testament to Besançon’s past reputation as the French clockmaking and watch capital. It counters the adage “Clock watchers never seem to be having a good time” because this converted clock watcher sure did. Time to talk about food (one of my favorite subjects). You know a restaurant is good is when you visit it two nights in a row. And we did just that at the Le Poker d’As where we celebrated our anniversary and reveled in its classic French menu. The inviting place is family run and situated away from the main tourist eateries and during our visits we seemed to be the only non locals in the place. The first night we enjoyed the aspargus soup and goose pate for starters followed by curry chicken and veal and ended our meal with a variation of desserts artfully decorated with an anniversary greeting. The second night we came back for the Coq au vin and ended with the creamiest of creme broulée. Both nights we paired our dishes with champagne and wines from Burgundy. 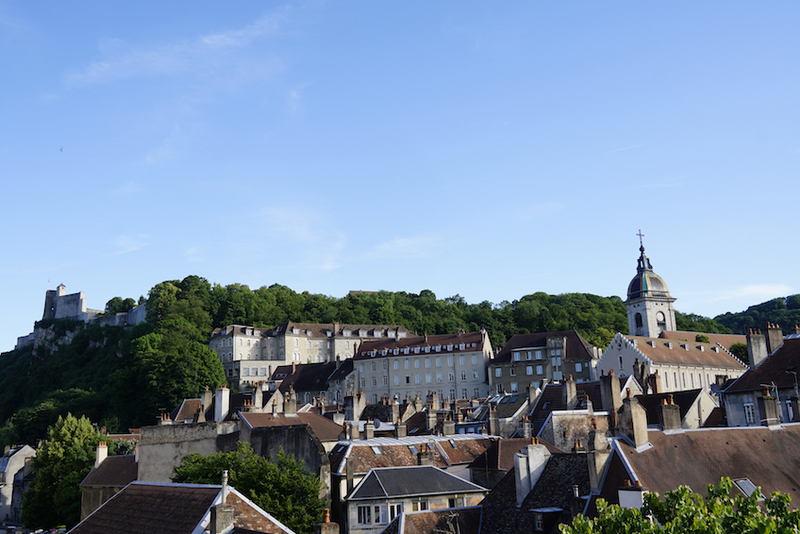 Exceptional food and wine is what brought us to Besançon and its charm and culture will certainly beckon us again and again. Tagged Besancon, Citadel, Culinary, culture, food, fortress, France, hiking, Jura Mountains, museums, UNESCO World Heritage Site, wine, zoo. Bookmark the permalink. Native Journeys | Powered by Mantra & WordPress.